Even very young children can understand the basic issues of fairness and no fighting. Talk to kids about fighting and other ways that a problem can be resolved. Always set the ground rules of what can be done and what can't to resolve an issue. For example, yelling, crying, or hitting or definite problem-solving no-nos. Ask them to come up with ideas, and then let try them out. You might be surprised at their solutions, and they may know what works best. Praise and positive reinforcement works wonders in helping to build positive child behaviors. The key point is to ignore fighting and then to lavish attention when they're caught doing something kind, positive or helpful. Children will quickly get the hint that good behaviors get them more attention than negative ones. 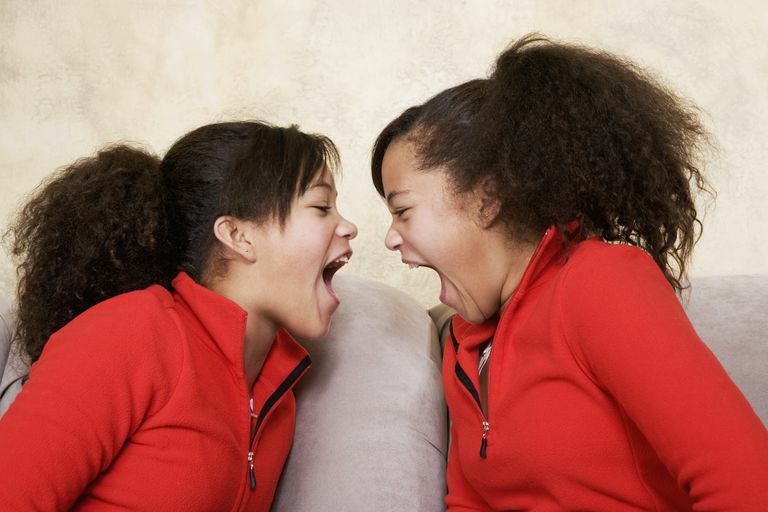 You can't expect kids to not fight and bicker when they observe it regularly among adults. Parents must serve as role models as to how to cooperate and get along with others. Set the example of expected behavior at all times. Remember, your kids are watching! Kids watch how adults behave and act when they are mad, disagree with something or are offended. Being calm under pressure and exhibiting self-control sets a positive example. Adults should talk with kids about situations in which they have felt angry or mad and what steps they took to calm down. If adults yell, embarrass, shame, or dole out angry or strong words, the result actually could be that the annoying child behavior of kid fights occurs again. Punishments like the ones above may escalate a child's angry feelings and cause them to act out more. Most kid fights are not meaningful and end quickly on their own. Adult intervention delays the process of children working it out themselves. Fighting is often a way for kids to get attention – and for some kids, negative attention is better than no attention at all. If adults ignore the fighting and don't let it become a "center stage" in the home or location, it becomes less of a reason to do it. One idea is to declare a separate room or space in your home as "the fighting room." Whenever kids or friends of your children fight, simply tell them to take it to the "fight room" and do not come out until it is worked out. The quickest trap an adult can get into is trying to investigate who started the fight, and who said what and then what caused the escalating issue. Taking sides or doling out punishment differently sets the stage for labeling victims and bullies. In most cases, the punishment should be the same: no exceptions. Again, the goal is to take the challenge out of fighting and strip any initiative for "winning" or "losing" a fight. Consider all the reasons kids fight and do what you can to eliminate those situations. Know when youngsters are at their worst, such as when they're tired or hungry or just had a bad day, and minimize any potential fight zones. Children need to know they are loved equally and are special, regardless of how they act, but that you as an adult feel most happy when they are at their best. Sometimes a hug is all a kid needs.